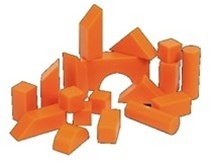 Set of 18 geoblocks used with the Tangramino, Equilibrio, Architecto and Cliko books. Using just 18 blocks, your children will experiment with construction, geometry, logical analysis, perspective, design, and spatial logic. This set contains just the blocks with no instructions. Pair with any of the four books or purchase a replacment or second set for your family. With two books and two sets of blocks you can transform Architecto, Equilibrio, Tangramino or Cliko into a two-player game. Adding a time element can provide a fun way for your slow and careful child to learn the benefits of speeding up.